Whenever you are looking for outdoor sign installation there are important factors to consider. For instance, building permits are required for electrical and non-electrical exterior sign installation. The material for channel letters, sandblasted signs, and promotional signs all matter so they can convey the message you want. Installing the sign you want is a difficult task for a business to undertake. That’s why you need a professional signing company to assist in maximizing your brand awareness with custom sign installation. 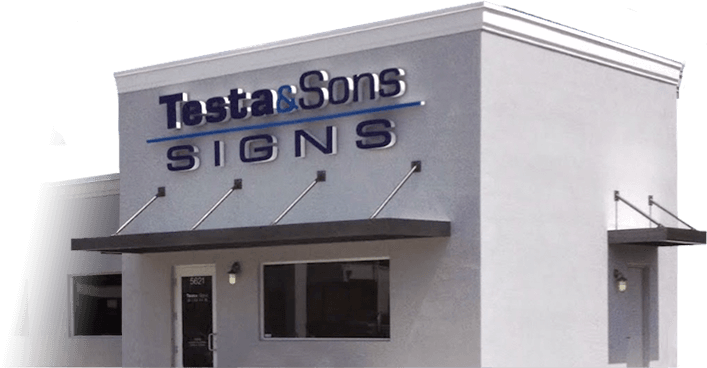 Here at Testa and Sons, we have the knowledge and experience to install the sign of your choice. Servicing the Fort Lauderdale area including Hollywood, we have been South Florida’s trusted sign company for over 20 years! Whether you are looking to place a few residential signs and banners, or install outdoor electrical signs, you need a company that is fully licensed to perform the work. Testa and Sons, are fully licensed to install a wide variety of signs. We install signs such as Department of Transportation (D.O.T.) traffic signs, L.E.D. electrical signs, and commercial building exterior signs. Our service covers areas such as Fort Lauderdale, and Hollywood Florida. Whether you have a storefront, plaza sign, or any sign installation need, Testa and Sons can help you. Not only do we install signs, but we repair and remove them as well. Our licensed and certified technicians take pride in safely installing, repairing, and removing sings. Still, don’t know who we are? Read more about us to find out. Why Sign Installation in the Fort Lauderdale / Hollywood Area? Every business could use the opportunity to raise brand awareness, what better way than to install signs. Not only do signs help business awareness, but they serve other functions as well. Have you ever driven in a community and noticed the street signs, or seen a promotional banner/sandwich board promoting a service? These are examples of how signs provide information from businesses. This is just some of the work we do at Testa and Sons. We handle all types of sign creation and installation. Being in business for over 20 years, we have the knowledge and experience serving the communities of the Fort Lauderdale area and Hollywood. Don’t hesitate to call us for a quote at 954-962-5840.